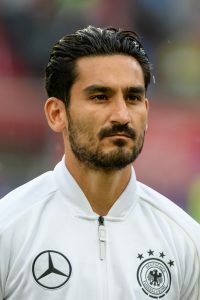 Manchester City midfielder Ilkay Gundogan has suggested Liverpool have an advantage in the title race due to their lighter fixture schedule. The reigning Premier League champions still remain in all four domestic competitions, whilst Jurgen Klopp’s men have already been eliminated from the Carabao Cup and the FA Cup. The German midfielder has said that the Reds’ less strenuous schedule could give them an advantage as both teams compete for the Premier League crown. Talking after Manchester City’s 3-1 victory over Arsenal on Sunday, Gundogan said: “When you have to run in the season you don’t think much about things. You go out and play. When you have no concerns in your mind you are able to win a lot of times. That’s how I felt when we were able to win at Dortmund that title. “We had an advantage of just playing Saturday, Saturday, Saturday and the week off in between. He [Klopp] is in a similar situation now with Liverpool – just the Premier League and Champions League on top. Manchester City sit at odds of 13/10 with Paddy Power to win the Premier League title.